Chiyo was my travel companion for many weeks and I wanted her to stay with me forever. However, as the saying goes, all good things must come to an end. Memoirs of a Geisha is to-date, one of my three most favourite novels of modern times. Chiyo's persona and grief touched me deeply. I felt her presence in a surreal way, and if I could, I would have gone into those words. I wanted to go into her world and change the unhappiness for her. That’s how huge an impact this beautifully crafted novel had on me. Recently we decided to visit Japan, and I am glad we chose Osaka as the starting place. Having landed in Kansai International Airport, I could finally say, there was hope to feel the spirits of the many Chiyos who went through the same life experiences and bitterness as she had. After a turbulent overnight flight and confirming that no paying passengers were forced out of their seats by the airlines, the first coffee was an all-black one with creamer. The coffee was actually part of the airport restaurant’s breakfast set. 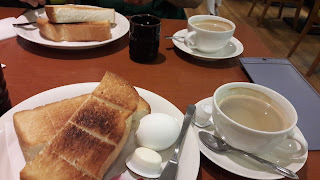 Having wasted the toast and the entire half boiled egg, SVN’s plea was that I did not make the meal decisions for the rest of the day, and even better for the rest of the trip. To be politically safe, that’s democracy practised wisely. Well, I am a 'wannabe' vegetarian (SVN is the genuine one), but I do occasionally skip by choice, and usually on the grounds that the chicken or fish is triple cooked and preferably does not look anything close to its original form. My colleague Stephan B’s words still linger on - it’s worse karma to waste food than to eat meat. He is right but I can’t help it. I think of Stephan and the chef at Walle who convincingly said it was chicken, chicken and chicken, not pork, I am afraid I don't eat anything that has more than two legs. That chef must have gotten himself confused that afternoon......oops, a slight off track there. My morning coffee was good, sufficient, served right - mainly with the help of the universal sign language. The friendly waiters made a lasting impression, and, in all fairness, I would give them high scores for trying. Today, I am not fussy at all, the coffee experience was just plain, lovely and relaxing. We all have a different take on things in general, especially on books. While I loved the Memoirs of a Geisha, you may feel differently about the book or Chiyo. There's really nothing wrong with that. As for me, she is vulnerable, loving and you cannot not help but adore and have compassion for her. The suffering Chiyo went through in her lifetime, through Goldman’s poetic descriptions are just too overwhelming. This makes her character an impossible one to reproduce. I love this book to bits and pieces, and I could read it over and over again, over another few cups of coffee. Count those stars friends, we are heading for Nara. 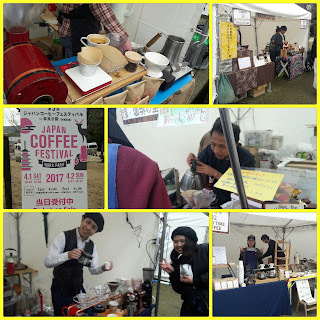 With that, I leave you with some shots taken during a coffee festival while I was there.